The largest private garden of Suzhou, Zhuozheng Garden in Dongbei Street is a historical site under key protection in China. It was included in the list of the World Cultural Heritage. The central part of the garden features a water pond of the garden features a water pond with three mid-water isles and pavilions and kiosks. The layout, natural and unsophisticated, is a manifestation of the Ming Dynasty landscape art. The corridor that winds its way in the western part is a fine architectural example in areas south of the Changjiang River. style pagoda was built without any timber. 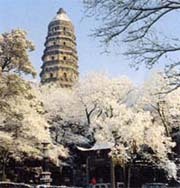 Since the Ming time, the pagoda has begun to slant to the north, now with a tilt of 2.34 meters. These are three ancient towns south of the Changjiang River, each with its own characteristics. 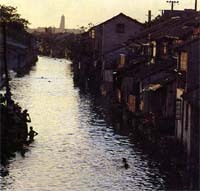 The Twin Bridges, the Shen Family Hall, and the Zhang Family Hall of Zhouzhuang; the two halls and three bridges in Tuisi Garden of Tongli; arhats in the Baosheng Temple of Luzhi as well as clothes worn by the local people have attracted a great number of tourists at home and from abroad in recent years.